Sanya will be back in the water in her home bay within a week after her first real shakedown for almost two months. Skipper, and former Volvo Ocean Race winner, Mike Sanderson and his crew are staying in Sanya, China for the entire stopover, using every second at their home port to recoup, repair and improve. It is the first opportunity the team have had to really service the boat, Sanderson said, having rebuilt the bow at Cape Town after a collision in Leg 1 and replaced their rigging at Madagascar after a failure in Leg 2. 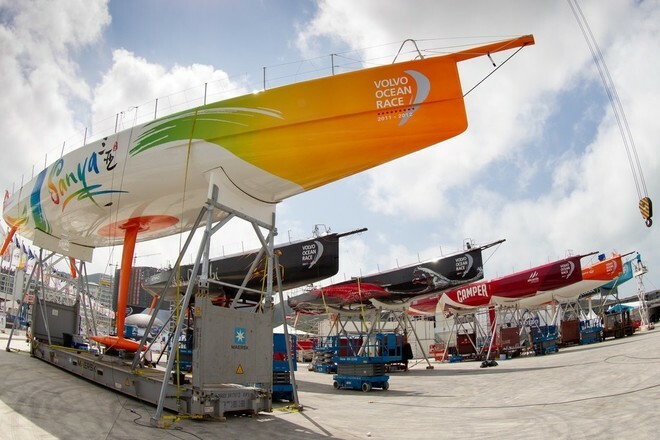 Despite having to repair the pod, a structure supporting two winches that broke 48-hours from the finish, the shore crew have plans to make improvements to help their team come back fighting Sanderson said. Shore crew manager David Duff said he expected the repair work to take about five days. ‘After the work we just did on the bow in Cape Town, this is tiny in comparison,’ he said. Sanderson is excited at the prospect of his shore crew, including riggers Robin Hilton and Frano Tregaskis, finally getting a chance to use their expertise for improvements, not just repairs. ‘Finally we can get the whole thing on track,’’ he said. ‘In all the pre-race planning you do you talk about strategy for stopovers, what you’re going to do with the time and how you deal with it all.